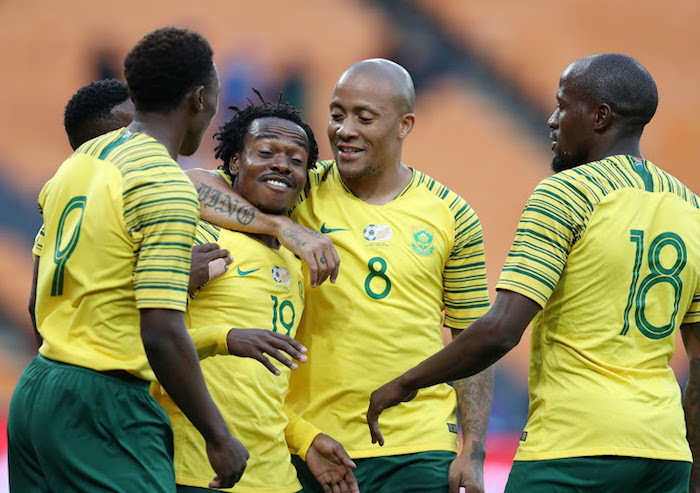 Seychelles might be minnows, but there are several positives that can be taken away from Bafana Bafana’s 6-0 win at the FNB Stadium in their 2019 Afcon qualifier, writes MARSHALL GOUTS. Stuart Baxter’s men produced one of the most merciless performances seen from our senior national team in recent years at a sparsely filled FNB Stadium. In fact, the flattering 6-0 scoreline became a record win for Bafana – overtaking the 5-0 victory against Guatemala in 2010 in a pre-World Cup friendly match in Polokwane. Detractors will say we shouldn’t get ahead of ourselves, based on Seychelles’ Fifa ranking, which comes in at a lowly 189th position. On paper, it was certainly a mismatch with the majority of the Seychelles players playing football part-time while occupying full-time day jobs. Given Bafana’s record against minnows over the years, as a fan, you’d have been excused for holding your breath in the opening 10 or so minutes of the clash. But what followed was a professional, ruthless performance of note, which should be built on. Keep in mind that prior to the clash, South Africa were hit with a number of injury blows in Bongani Zungu, Keagan Dolly (both long-term), Sibusiso Vilakazi, Themba Zwane and Vincent Pule, making their job slightly tougher. Yes, we could have inflicted a heavier scoreline on the Islanders, had we converted half our chances, but let’s give credit where it is due. We played attacking football from the onset, we scored goals and there were newly formed partnerships on the pitch that can definitely be built on. In defence, the central-defensive partnership of Thulani Hlatshwayo and Buhle Mkhwanazi continued to soar. In midfield, the partnership of two combative midfielders, Kamohelo Mokotjo and Dean Furman, gave wingbacks Ramahlwe Mphalele and Sifiso Hlanti absolute freedom to bomb up the flanks and add to numbers in attacking areas. One of the biggest talking points from the victory was the partnership between European-bound attackers Lebo Mothiba and Percy Tau. The duo directly contributed to two of the six goals scored, with Tau assisting Mothiba and Mothiba later repaying the favour. All in all, it proved a good day at the office for Bafana, with each and every player standing up and wanting to be counted. With the scoreline comfortably in our favour, Baxter had the luxury of introducing Dino Ndlovu and Teboho Mokoena to the fray – both of whom got their names on to the scoresheet as the cherry on top. As the fans, we are often quick to label Bafana as specialists in failure when results don’t go their way, but we remain mum when it’s time for appraisal. Yes, we should not get ahead of ourselves by celebrating the thrashing of minnows, but in retrospect, we did well to put the disappointing goalless draw with Libya behind us to claim a morale-boosting victory that moved us to the top of the Group E standings. South Africa will need to erase memories of their thumping victory quickly as they prepare to face the same opponents in the return leg of the fixture on Tuesday with kick-off set for 3:30pm. More of the same please, Bafana!